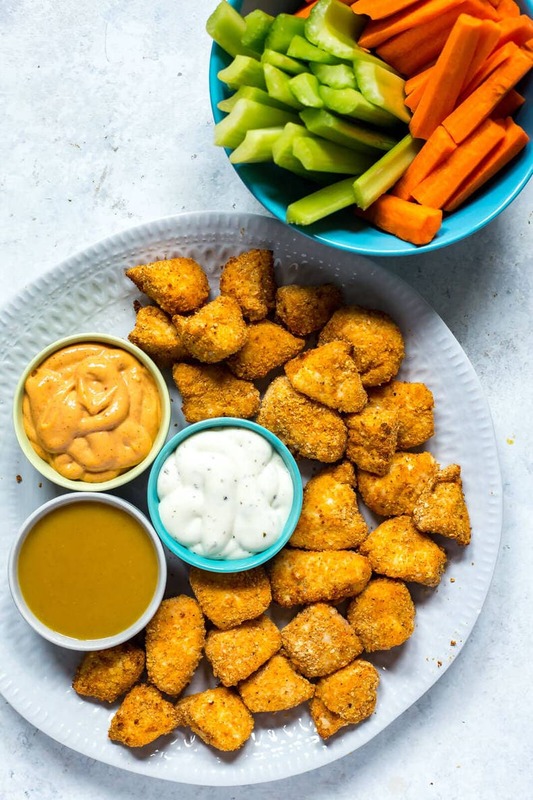 These Super Easy Airfryer Homemade Chicken Nuggets are a delicious, healthy way to enjoy your favourite fast food at home without the guilt - and the best part is that you can freeze the leftovers! In a large bowl, soak chicken in buttermilk for 5 min. Preheat Airfryer for 8 minutes on 400 F.
Mix breadcrumbs, panko breadcrumbs, parmesan cheese, paprika, garlic powder and salt and pepper together in another large bowl. Drain buttermilk from chicken pieces, then add chicken to breadcrumb mixture then toss well to coat. Add chicken to Airfryer once it's done preheating, adding nuggets in a single layer and spraying with cooking spray. Cook for 4 min, then flip and cook another 4 min. You may need to do the chicken in two batches. Serve with carrots and celery and your fave dipping sauces. Enjoy!